This should be titled “Nanoon does NYC, 2008” but I had a clash with culture that I wanted to write about. Shannon came to town briefly, so we had to squeeze a lot into a little. We finally got her to Hell’s Kitchen, but she’s avoiding uncooked fish and alcohol <hint> so she couldn’t have the tuna tostadas! There was still enough for her to eat and she was happy. 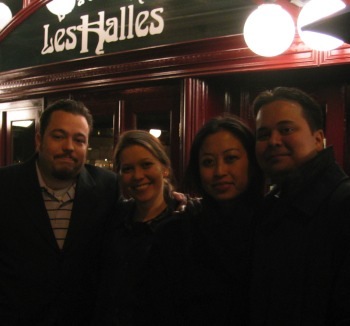 I also finally went to Les Halles. I honestly wasn’t expecting much. I never got the impression Anthony Bourdain became a TV Personality based on his cooking. I always thought it was about his writing. That being said, it is a successful NYC restaurant in a neighborhood with some decent competition. They have the usual French staples, but it seemed that steak was their specialty since they had many different cuts. I got a hangar steak with Bearnaise. We also got an order or escargot as well as pork confit. Ryan is Mr Confit, so we had to get that. The escargot was amazing. I’ve had escargot, but never really thought anything special. This was something special. The hangar steak was perfectly cooked and was so tender it reminded me of my first taste of Kobe beef (that was actually cooked properly) The rest was fine (onion soup, wine, bread) but the escargot and steak is what really was special. Happy! Shannon has been a Patrick Stewart fan ever since Star Trek and apparently Ryan is a big fan of Shakespeare. The opening night of Patrick Stewart as MacBeth was last night, so how could we not be there?! I’ve always made it a point of avoiding Shakespeare. I decided a while ago that because my mind is visually based that this was inherently incompatible with literature that is artistic with the delivery, as opposed to using plain language and instead being artistic with the mental visual they produce. Same reason why I don’t get poetry. However, I like to test my pre-conceptions periodically and I like to see performers perform so I thought it’d be a shot. While I didn’t have a revelation (I still don’t see what people see in Shakespeare) I do think it is in the realm of Shawn-possibility now. I’m starting to think many people are probably like me but just approach Shakespeare and classic literature differently. I think I’ve always approached literature like a movie or a modern narrative and expected to create visual mental images from the delivery. After this week, I’m thinking this approach is wrong. Before I went, Ryan gave me the basic plot line, which was a great help. I think I would have appreciated it even more if I read the Wikipedia entry beforehand. During the show, they could have been speaking French for all I understood. But I could tell when the plot lines were happening because of the “preparation”. Afterwards, I read the Wikipedia entry, and every plot point reminded me of the specific scene, so there are memory association “anchoring”. I can see that repeated reading/watching/studying would create familiarity of the work, and might even create enjoyment! Definitely a different approach one might use for Harry Potter!